No Star Wars motif drones flew above either (at the Castleton Drive and Mount Abernathy Avenue cross streets in Clairemont). 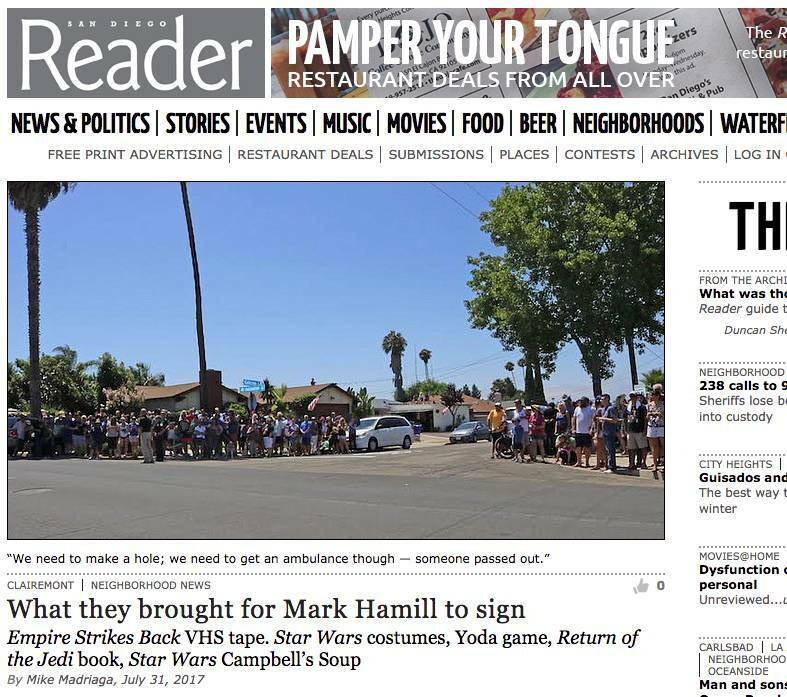 On July 30 at about 2:30 p.m., Crubbs, from the San Diego Police Department, was handling some of the crowd awaiting Mark Hamill’s arrival. Hundreds were present to witness the ceremony for the honorary “Mark Hamill Drive” to take place — others just wanted his autograph. Many of the people here wanted their items signed because Hamill’s autographed memorabilia sells for top-dollar on the eBay site. A signed comic book is going for almost $9000, an autographed poster is selling for $4000, and a light-saber with Hamill’s signature on the hilt is auctioning at about $1000. “I have a can of [Star Wars] Campbell’s Soup and a Funko action figure,” said Nico Vitali, who was selling lemonade for 50 cents with his buddy Caleb — under his dad Michael Vitali’s supervision. Both Nico and Caleb were hoping to get their stuff signed. After all, a Luke Skywalker Funko toy (just like the one on their table) paired with a Han Solo toy, signed by Harrison Ford; are selling for $699. Caleb, 10, knew “the dark side” though, “you actually have to pay $125,” he said. 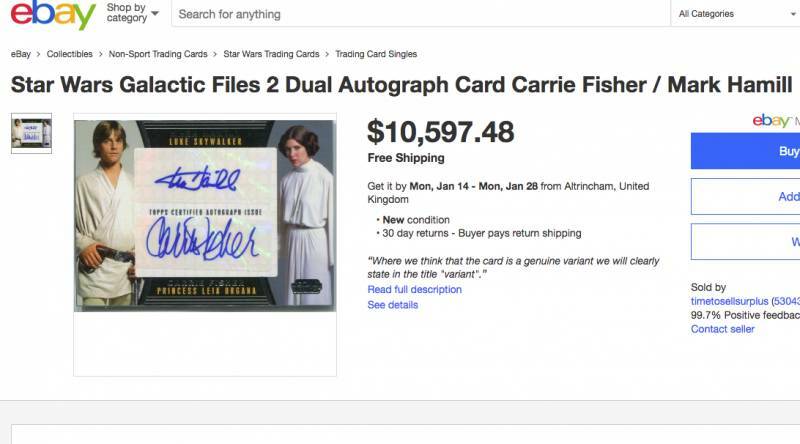 At the 2015 Star Wars celebration in Anaheim, they were charging $125 for Hamill’s signature and $70 for the late Carrie Fisher’s, who played Princess Leia. “And now her autograph sells for lots of money,” John said. 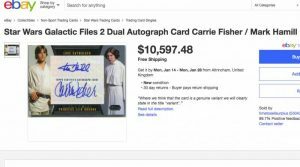 “A Star Wars Galactic Files 2 Dual Autograph Card [signed by] Carrie Fisher / Mark Hamill” is being sold for $10,597.48 on eBay. 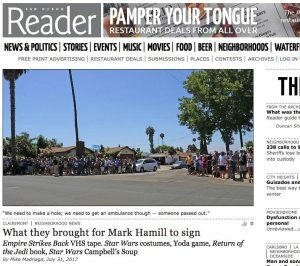 Later this day, after the unveiling of the Mark Hamill Drive street sign, Hamill was witnessed signing items — free of charge.